Quality 200 piece personalised photo jigsaw puzzle made from your favourite image. Other sizes of personalised jigsaws available. 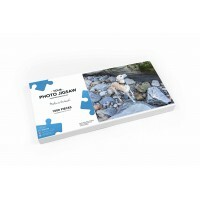 A keepsake personalised jigsaw puzzle of your chosen photo. Simply upload your digital photograph (or post us a copy) and we will create a quality boxed jigsaw puzzle. The box lid will also have a copy of the image along with your chosen message. An ideal personalised Christmas gift which also makes a unique present for weddings, birthdays, mothers day, fathers day, christenings or for that someone who has everything! This is a 200 piece personalised photo jigsaw puzzle and is the same size as our 500 piece photo jigsaw (50cm x 38cm) and therefore has larger pieces. Instructions - For detailed explanation please see the detailed instructions file in the download section below. 1. For best results please use a .jpg photo file saved at 300 dpi which is at least 1MB. 2. If your image is more than 5MB reduce the dimensions leaving the resolution as high as possible. 3. On the product customisation section below, click on the 'choose file' button below to locate your image. Click 'choose' to add the image to the box. 4. You can add your own title in the text boxes. The title can be a maximum of 60 characters over two lines. If these boxes are left blank there will not be a title printed on the box. 5. Click 'save' to upload your image. This may take a while depending on its size and your connection speed. Once completed your image will be displayed next to the 'browse' box.